It's time for another round of Freebie Friday. Is there any food that screams 'summer' more than watermelon? I think not. 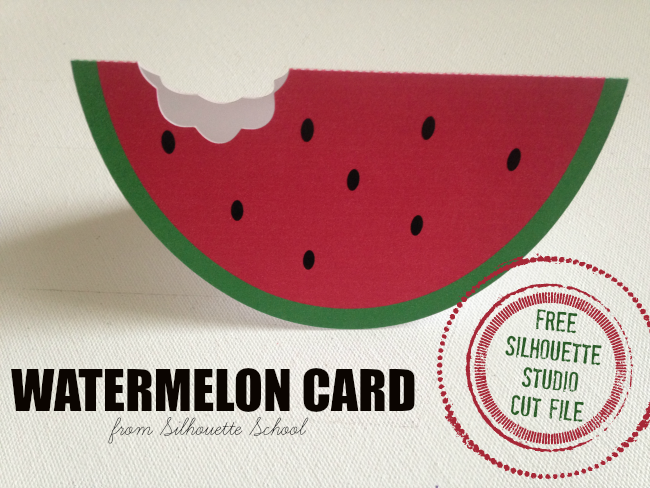 So in the spirit (or perhaps dream) of endless summer, I thought I'd share a free watermelon .studio cut file with you this week. I love designs like this one that are super cute (IMHO) and are suuuupper easy to design. Everything else as "No Cut"
BUUUUT since I love you I did it all for you...although you know me, my theory is more along the lines of 'teach a man to fish...' so I did want to quickly show you how it's done. Easy, right?! Fortunately for you, you can skip all that and simply download the file before adding the registration marks and printing and cutting. You can even get a little more fancy schmancy and change the colors by ungrouping the design and filling the pieces with different colors, gradients, or patterns. Enjoy..but please remember, as are all cut files on Silhouette School, it's for personal use only. Look at your copy of Designer Edition under "Help." Go down to the last item "About Silhouette Studio" and click on it. It will say V2 or V3. The difference is if you downloaded the last upgrade. If you did, use the V3 files. At the risk of sounding completely stupid, how does it get colored? I get how the file that's sent to the Cameo is colored, how does the card that gets cut get colored? I think the file names are switched with what they actually are. Thanks for the file! I love your free downloads and really appreciate them. Thanks for providing the directions for us to learn to do it ourselves. I am fairly new to my Cameo and purchased it because of it's design capabilities so appreciate the assist in the learning curve. Love your blog and all the help and information you provide.